Over the last two years Arcadia have blazed a trail through the festival scene with their scorching mix of visual effects, hard hitting DJs and a colossal rig plucked straight from a kitsch sci-fi B movie. This year they're back again at Glastonbury with an even bigger show. It's a damp Thursday night before Easter and I'm trudging through a bleak landscape of industrial units on my way to Bristol venue motion. Along with me is Bristol local Gez, who spends his festival time out and about for the event radio station Worthy FM. We're here to catch up with the creative brains behind Arcadia and see the show they'll be taking on tour this year. It's two hours before the gates open and arriving at motion we're greeted by a curious mix of attractions. There's modest little venues housed in tents. A big steel dish acting as an elevated fire pit. Stalls. Lines of portaloos. It's as if a tiny festival has been transplanted into an industrial estate, with some steady drizzle to complete the effect. Finding the Arcadia rig indoors seems incongruous. With gas jets that can fire flames as high as fifty feet, this is like seeing a caged beast. And yet it's here, far away from festival fields, that the team have notched up some of their most impressive performances. For new year's eve, Arcadia headlined 'The Greatest Show on Earth' - a night that saw an unexpected scramble for tickets, selling out weeks in advance. Even with the constraints of being indoors, they took motion into meltdown with one of the hottest new year's events in the country, never mind Bristol. Since then the rig has been dormant, quietly hibernating in this Bristol backstreet. The creators have been away, getting some R&R. Now they and their crew have regrouped again around their giant creation. Gas bottles plumbed in, electrics fired up. Once again it's showtime. Yesterday was rehearsal day, running through the complex show, presumably – if nothing else – to make sure they don't accidentally set each other on fire. Tonight the finishing touches are going on. There's a myriad of performers, technicians, security and stewards, all waiting calmly for people to flood in at ten O'Clock. With little more than 30 minutes to go, Bertie Cole and Pip Rush stride over to meet us, having just done an interview for Glade Festival. They're wearing schoolboy grins, and there's an air of nervousness – I'm not sure who is least experienced at interviews; me or them. Bertie though is soon into his stride. “We're combining light, sound and performance”. It's a phrase that sounds a little flat, and is at odds with the intensity of what they create. It belies a very definite modesty on the part of Cole and Rush. Several weeks beforehand, I'd floated the idea of doing a few photos of them themselves, for the review. Cole wasn't keen. “Ermm... It's not really about us... it's more about the show”. Their reticence is perhaps wise. Other impresarios in their shoes have let their egos become their undoing, losing sight of what has made them successful. It seems unlikely that the level headed brains behind Arcadia will head down that path. One suspects they get a bigger kick out of chopping up metal rather than, say, chopping up powder. “We've just come back from doing 700 miles around Britain on our motorbikes – going to military scrapyards”, explains Cole, enthusiastically. “We even went to one that was Customs and Excise seizures!”. I ask what their favourite purchase was. The pair turn to each other, grinning again, and don't say a word. It's not clear whether they have a big secret, or whether they've simply not thought that through. Much of the Arcadia thing is about what they create, rather than a single piece of salvage. There's no helicopter, fighter jet or armoured vehicle in their arsenal. Instead, an array of curiously shaped metal items are reformed into their giant afterburner rig. It's only when you look closely you see a turbine blade here, or an engine housing there. It's a dynamic process too. With their base – a ramshackle farm just south of Bristol – being just up the road from Pilton, it sounds like a convivial and unhurried life. A creative commune with an unlikely penchant for Calor Gas and petrol. With a steady rise in bookings though, it's perhaps not as carefree as it might seem. “At Rockness we'll have a second build team already starting on Glastonbury. We'll then be bringing things down from Scotland and slotting them in at the last minute. We did Electric Picnic and Bestival back to back last year, so we know we can do it”. The Glastonbury show will, of course, be the biggest. I try to tease out some more details. All they'll say is that it's not Tesla Coils - the monster size plasma creations seen occasionally at the likes of Burning Man. But any more than that, they're not revealing. In the time talking to the duo, it's clear that Pip is happy to let Bertie do the talking. And yet Pip's family background speaks volumes. There's a mix of painters of sculptors, not least of which is if half brother Joe Rush, a founder of the mutoid waste company and Trash City, and a clear influence on all things Arcadia. Tonight though, it really is all about the show, and - reluctantly - we let them get on with doing just that. As it turns ten, the courtyard begins to fill with punters and puddles. There's a palpable air of excitement. A girl walks past with her friend, and exclaims “Oh my god... this sooo cool!”. One group have travelled all the way from Inverness, clearly too impatient for the show to come to them in June. The bar area in the room adjacent Arcadia is packed, and behind that a small garden area is soon filling up. The slightly sprawling nature of motion means one is never quite sure what one will find round the next corner. It's a fitting home for a show that's full of surprises, and it's that we head back in to see. Ten to midnight, I'm perched on the roof-come-stage above the production office, sorting through lenses. Spreading out before me, the main room is at capacity. One in, one out. Stewards decked in hi-viz and overalls, stencilled with the Arcadia logo, marshall the crowd clear of the incendiary machines that will work the show floor. Then, at midnight, the whole thing comes gloriously to life. A guitarist perched on one podium, keboards player on another, an aerial artist working the high space above the crowd. 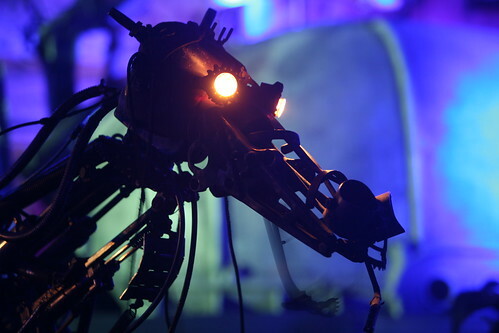 Then a mechanical horse fires up – breathing flames and ridden by a demonic showman with a fiery whip. Faced with this other-worldly contraption, the crowd stood in front are in awe – beaming and wide-eyed like small children seeing fireworks for the first time. Suspended from giant crane arms, mounted on traveller-chic trucks either side of the rig, come two boxy shrink-wrap packages. 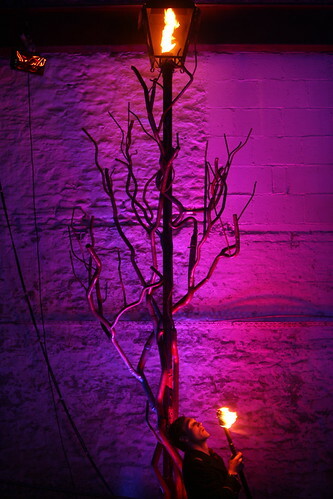 The intertwined figures inside claw their way out, spotlighted above the audience. Then there's more fire. There's always more fire. In amongst wall runners, more aerial acts, and dancers in soot-grubbied overalls, a girl appears with a flamethrower. At times she brandishes it like a guitar, firing streaks of flame above an ecstatic crowd. It's these elements that makes Arcadia work on many levels. For dance music fans, all the boxes are ticked. Funktion One sound system? Check. Top DJ line-up? Check. But equally it will dazzle a five year old fuelled on nothing more than Ribena. A week later I mention this thought to Bertie, and it seems to strike a chord. "Having a broad appeal is really important to us, that there's something in it for everyone. It's why Glastonbury really matters to us - there's a wider spectrum of people." At the end of the 30 minute show, the air hangs with the smell of burnt petrol. Although that part of the evening may be over, there's no shortage of people still queueing to get into Arcadia's room. A deservedly busy night ahead then. A busy year too. As well as Glastonbury and Rockness, there's Glade and Bestival. With stablemates Trash City taking their own show to London's Roundhouse, one wonders whether Arcadia could take another step - having conquered the UK festival circuit. "It would be amazing to do some proper touring." says Cole. I press him further. With Glastonbury taking a year off in 2012, it seems like there's an Arcadia shaped hole ready and waiting in the Nevada desert. Do they have plans for Burning Man? Cole is enthusiastic, but is playing wait-and-see: "It shouts quite loud... who knows!". Whilst the team are - outwardly at least - modest about their expectations, there's a healthy precedent for alternative performance art. Troups such as Brighton's Stomp, Argentina's De La Guarda and the French Archaos team became global successes. For now though, for Arcadia, things remain more down to earth. On my way back to London, I get a message from a friend saying she might be working with the Arcadia 'family' this season, and is looking forward to a string of festivals. When I get home I find, in my photos of the show, a shot of an aerial performer who used to work in my local pub years ago. So it seems like you can still run away with the circus. Just remember where they keep the fire extinguishers. 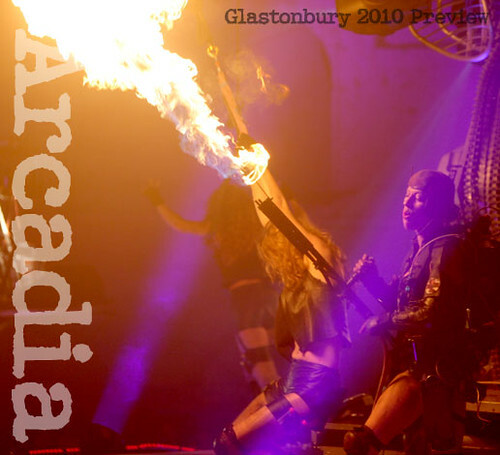 For Glastonbury 2010, Arcadia will feature their biggest rig to date, two indoor venues and their most eclectic line up yet - with everything from laidback grooves to the hard edge beats that are familiar Arcadia territory. The lineup includes the introspective grooves of the Joe Acheson Quartet in a daytime warm up session and genius beatbox madness from Beardyman. The biggest surprises though - and ones sure to draw a crowd - are the veterans. Cherished ska band, The Beat, will be putting in an early evening slot on Saturday. The following day will see 'Sir' David Rodigan - a classic DJ of the roots and reggae clash scene - bringing his dubplate infused selection to the Sunday night closing session. 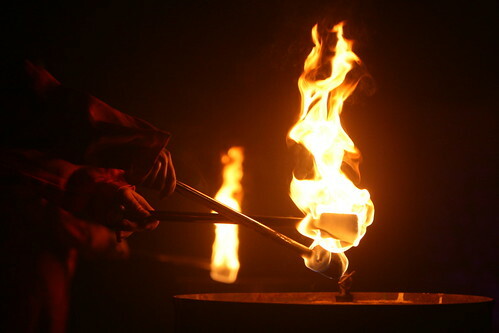 As well as the music, there's two epic fire shows every night from Friday. The early show Light Up will be a family friendly affair (although, knowing Arcadia, that won't mean tame). The midnight show Arcadia Spectacular vs. Freefall Collective will see the evolved full show performed, wringing every inch of flame from Arcadia's most expansive rig to date. The new Arcadia field - formerly home to Trash City - will also see collaborators Invisible Circus and Wrekon hosting their own indoor venues running until dawn, with lineups to be announced before the festival. And, when thirst strikes, a dedicated bar run by Arcadia themselves will keep the drinks flowing.